Phnom Penh, Recently - Building on the success of last year’s ‘Fly and Meet Double Bonus’ campaign in Cambodia, Lao PDR, Myanmar and Vietnam (CLMV), Bangkok Airways led by Mr. Varong Israsena Na Ayudhya, Vice President – Sales (middle) and TCEB led by Ms Nooch Homrossukhon, Director of Meetings and Incentives Department (left) have teamed up again to make the campaign even more attractive this year by lowering the eligible group size to only 30 persons. This move will benefit even more organizations in the four countries when they plan corporate meetings and incentives to Thailand. Mr.Varong Israsena Na Ayudhya, Bangkok Airways’ Vice President – Sales, commented, “We are delighted to be an exclusive airline partner of TCEB for the ‘Fly and Meet Double Bonus - Redefined’ campaign for the second year running. The positive feedback we received last year reflected the tremendous potential traffic in meeting and incentive sectors from the CLMV markets. 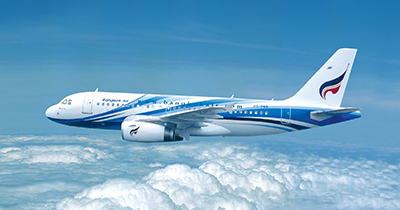 Bangkok Airways’ longstanding presence in these markets and the fact that Bangkok Airways is a full-service carrier make it very suitable for corporate travelers. 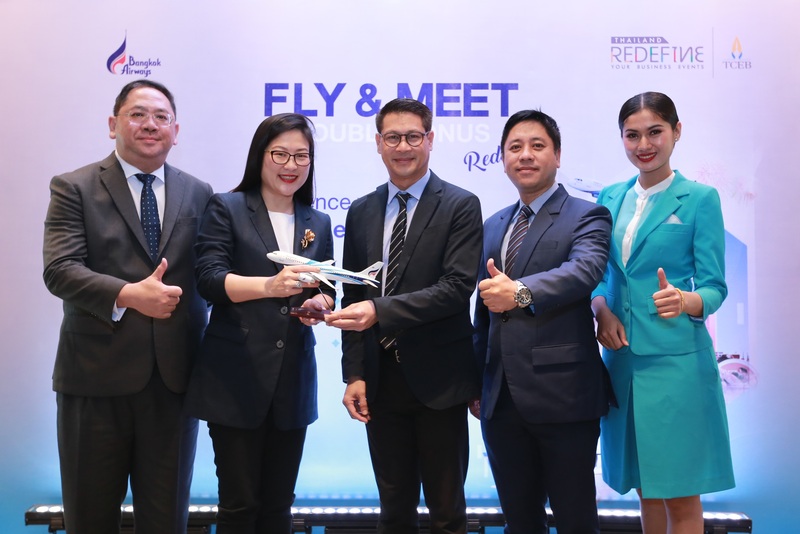 With 2019 re-arranged package that provides more privileges to our customers, I strongly believe this ‘Fly and Meet Double Bonus - Redefined’ campaign will attract a growing number of business travelers from Cambodia, Lao PDR, Myanmar and Vietnam”. Ms Nooch Homrossukhon, Director of Meetings and Incentives Department, TCEB, said “With the number of MICE travellers from Cambodia, Lao PDR, Myanmar and Vietnam (CLMV) growing 206% in 2018 and the opening of many new attractions, Thailand Convention and Exhibition Bureau (TCEB) and Bangkok Airways launch the new ‘Fly and Meet Double Bonus – Redefined’ campaign with a lower requirement of only 30 persons to encourage more outbound corporate meetings and incentives from the four countries to Thailand. The four countries are rated among the fastest growing MICE (Meetings, Incentives, Conventions, and Exhibitions) markets for Thailand. The business landscape in these markets remains very dynamic, with the growing economy, investment and enterprises”. To qualify, each group must comprise at least 30 persons, fly to Thailand on Bangkok Airways, stay for at least two nights, or hold an event at a venue recognized by the Thailand MICE Venue Standard (TMVS) or a registered hotel.